We are paying homage to a Thai mother, Wan Pen Cline, who was a very important person to one of our sous chefs, James Thompson. Although he has lost touch with her over the years, he knows her story and cuisine very well, and is very eager to share it with us this month. While there are many places in Portland to find great Thai cuisine, Wan’s dishes are different. They are made with the recipes of a real Thai mother, so you can really taste the “love.” Wan Pen was born on Quadulan, a 1 ½ mile-long island off the coast of Thailand. In the 60’s, the United States built a military base there, and that’s when Wan met her American husband, Tom Cline. They moved back to the United States in 1975 after their son was born. In 1984 the family moved next to James in Lexington, Kentucky where Tom was stationed. From the time Wan woke up in the morning until she went to sleep at night she was in the kitchen cooking, as she had for her family when she was in Thailand. Wan shared her food with all the houses on James’ block, bringing a foreign culture to a small rural town through her food. 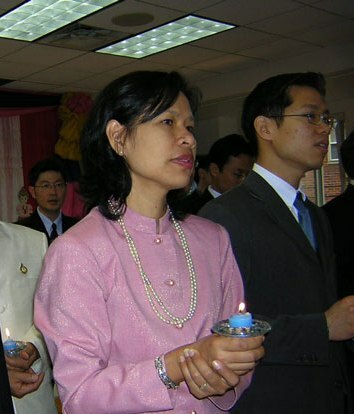 Though her neighbors were only familiar with southern American cooking at the time, they quickly fell in love with Wan’s exotic and flavorful Thai cuisine and would often request specific dishes and recipes. James already had an interest in cooking, so he would spend hours next to Wan in her kitchen to learn how to make her wonderful dishes. After her husband retired in 1990, Wan opened her own restaurant in Richmond, Kentucky and it was extremely successful. When Wan’s husband died four years ago, she decided to return to her homeland. Unfortunately, James has since lost touch with her, but her wonderful cooking lives on today with the recipes she shared with James over the years.